With these deliciously simple ideas from Chef Lorenzo, you’ll get dinner on the table before the kids even have a chance to ask what’s on the menu. You can make each family-friendly meal in 40 minutes or less. All feature fresh, delicious ingredients that beat takeout any night of the week. With two different kinds of peppers, plus garlic, almonds and cilantro, this pesto pasta dish has heat, comfort and flavor at the ready. Want to make it even simpler? Use jarred Barilla® Traditional Basil Pesto instead of starting from scratch. This classic Roman dish has everything you could want from a plate of pasta—creamy cheese, al dente noodles, and just enough heat from the freshly ground black pepper. Serving kids? Top the adult servings with pepper, and leave the kids’ plates plain and cheesy—or add in some fresh peas. Put fresh farmers market veggies to good use with this quick pasta toss for a 30-minute weeknight winner. Change up the vegetables according to the season and what your family likes. Spring asparagus, fresh basil and crunchy pine nuts combine with al dente pasta for a perfectly balanced dish. The mix of shrimp and scallops adds an undertone of sophisticated flavor that makes this quick dish one to remember. Twenty minutes is all you need to prepare this pasta dish that will remind you of your favorite caprese salad. Mix it up by using parsley instead of basil, and a mix of colorful heirloom tomatoes for the cherry tomatoes. Got 40 minutes? You can have this healthy Latin-Italian fusion dish on the table to feed your hungry crowd. The fresh vegetables and bold flavors make this a comfort-food dinner you can feel good about. Pasta night easily transitions to a hearty soup dinner with this spaghetti-and- chickpea dish. 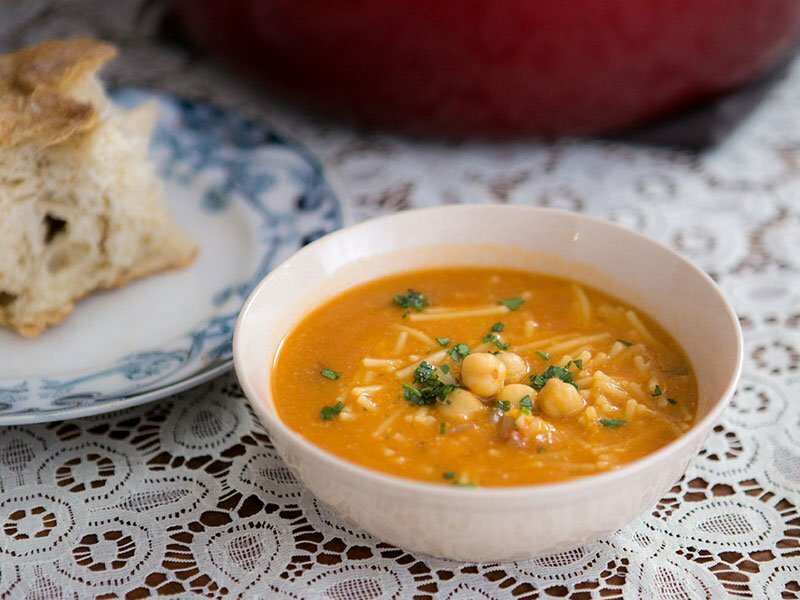 With healthy carbs from the pasta, and fiber and protein from the chickpeas, this soup will leave your whole family satisfied. With ample protein and full-bodied flavor, this easy pasta and sausage dinner will have your family begging for more. The Barilla® Tomato & Basil Sauce brings flavor (without adding any work), and the Romano cheese lends classic Italian appeal. Fresh flavors and summer vegetables make this a soup that is light enough for warmer months. But the ease of preparation will have you making it all year long—for gatherings and easy weeknight dinners.